At Laurus College, we provide every student with a friendly and supportive learning environment that includes smaller class sizes and real-time assistance from caring staff and instructors. Our emphasis on career opportunities in all of our program offerings helps open up avenues of opportunity that previously may have gone unrealized. All of the programs that Laurus College offers are available both online and at each of our locations: Atascadero, Oxnard, San Luis Obispo and Santa Maria. 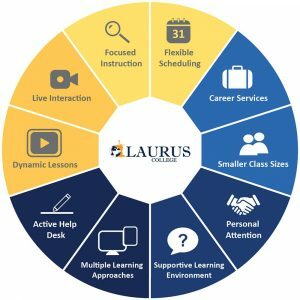 The mission of Laurus College is to serve as a quality institution of higher education dedicated to creating a quality experience for all of its students by combining career-focused programs and the necessary fundamentals of interactive learning to supply the tools needed to succeed in the 21st century. The Laurus College experience enables our students to start their careers and to lay the foundation for further education that will augment their careers. Provide a quality education within a well-planned, relevant, and concise curriculum to give students success in their chosen field. Educate students with relevant technology, equipment, and tools used in the program area. Provide and develop personal growth and life skills through participation in all classes, cultural enrichment opportunities, and/or guest lectures. Provide a skilled and experienced educational faculty and staff devoted to the personal and professional skill development of each student. Provide student services to assist students in obtaining the needed skills and employment assistance in their selected career field. Laurus is derived from a Latin word meaning “success.” We at Laurus College strive to make our learning environment a place where caring and excellence thrive. The name of our college signifies our commitment to our goal of success for students and serves as a reminder of our most important mission, a quality education and a quality experience. The Laurus experience is our commitment to a quality education and a quality experience for every student. The quality education rests on the dedication, experience and caring of our staff and faculty, and also requires the serious pursuit of career goals by the student. The quality experience centers on our passion for excellent customer service. The programs at Laurus College prepare students for a career. Students at Laurus College gain an understanding of how their field of study operates. Students study current and emerging markets and the impact those markets have on the industry today and in the future. Laurus College prepares students for a career and for the world. All of the locations operated by Laurus College are modern, well lit, air-conditioned, clean, and safe, and include administrative offices, classrooms, and student lounge areas. Students at Laurus College learn in modern classrooms, with a maximum number of 30 students in a typical classroom or lab, using industry-standard software and equipment in their programs. Students work at individual computer workstations, where they interact with their instructors and fellow classmates during scheduled class meeting times. Classroom lectures are supplemented with additional open laboratory time during which students’ complete assignments and work on their program’s software and equipment. Classroom computers are all Internet-connected, and equipped with all software and peripherals students will need during their enrollment with the college. Students also have access to printers, copy machines, and fax machines at each location. The college also provides a 1,800 square foot conference center for research and study on a separate site near the learning site and administrative offices in Santa Maria, California.